Sometimes I have to stop and look around me and think, “Wow, this is my life.” Not in the ironic way I do when I’m being self-deprecating, not in the exhausted way I do when something inevitably goes wrong. There’s only pure, unadulterated awe: wow, this is my life. It doesn’t always feel real. Maybe it’s because I make a lot of decisions that feel like they were made on a whim. I’m not always as practical and thorough as I wish I were, but you can’t say I’m not opportunistic — when I see a possibility, I go for it. So when my friend asked me if I wanted to travel to Scandinavia with her to visit her birthplace, I didn’t have a second thought. Of course I wanted to. It seemed ridiculous to say no. A week later, I had my plane ticket. It took a very long time for that one to feel real. Even when we landed in New York City for a 18-hour layover, I didn’t believe it. Not even when we landed in the Copenhagen airport or spent half a day walking around Lund, Sweden. It wasn’t until we got on an early morning flight to Norway that it finally hit me: wow, this is my life. I’m actually in Europe. Our first stop was Oslo, Norway’s capital. When we finally arrived, I was in awe of the city — let’s be real, no matter where I go, I’m always a little starry-eyed. It’s the romantic in me, maybe, the little piece of me that watches the world through rose-colored glasses. I can’t help but love everything around me — the crowds of rowdy children, the people sitting outside cafes speaking in languages I don’t understand, the architecture and cobblestone streets. I fall in love a little more every moment I’m there. What I didn’t realize, though, was that Oslo really was just the beginning – with every new place I went, my infatuation with Norway only grew. For me, the only way to describe Norway is “a fairytale”, because that’s exactly how it feels. Though Oslo reminded me of other European cities, as soon as we left for our next destinations, it no longer felt like we were on the same planet anymore — it felt like we had entered an alternate universe where dragons exist and everything of the imagination is tangible, real. 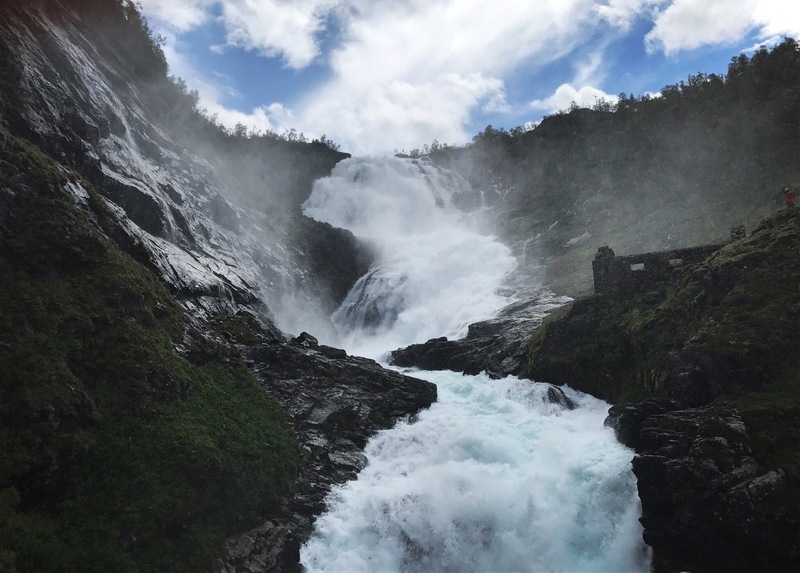 We took trains through mountains full of raging waterfalls, boats through fjords that loomed like monsters in the distance, ships from one side of the country to the other. We climbed mountains that looked as though fairies lived in the little crevices between the mossy rocks, we explored aging towns made of wood that made me feel like somehow, somewhere, one of those witches we read about in story books was hiding inside one of the homes, cooking up something in her caldron. It was hard for me to wrap my head around the fact that somewhere, thousands of miles away, my hometown still existed with all my friends and family within it. I couldn’t even fathom it. I loved every second in Norway, honestly, the good and the bad. I don’t care that I nearly died by slipping near the edge of a cliff, and I don’t care that I got lost in Oslo for nearly an hour, and I don’t care that all I could afford to eat in Bergen was bread and cheese, and I don’t care that it rained so much in Stavanger that I nearly froze to death and my shoes are permanently wet. But no matter how hard I tried to shake it, there was one thing that wouldn’t stop bothering me — there was no feasible way to capture the country’s beauty. Not the way I saw it through my own eyes, at least. I could take a million pictures and never quite get the way the mountains look like layers in the distance in Flam. I could write pages and pages but fail to describe the way the low clouds blanketed the houses nestled high in Bergen’s mountaintops. I wish I could let you see it. And I guess that’s where I learn my own limits, or perhaps the limits of human expression entirely. I’m not sure if I don’t have the vocabulary to explain the world around me or if it simply doesn’t exist. I can’t describe the colors that kissed every cobblestoned street or the moss, so green and spongy and alive, that wrapped itself around tree trunks and over jagged cliffs. 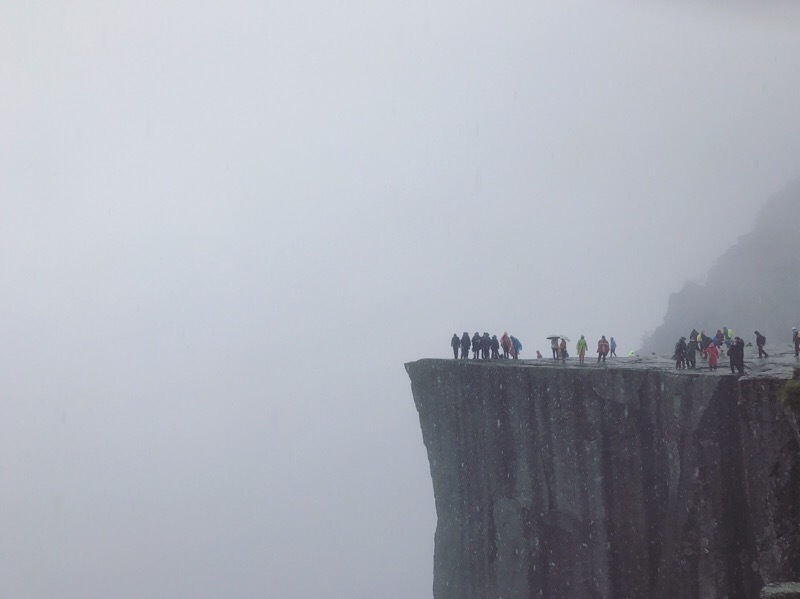 I can’t describe the sound of water as it angrily rushed down the side of a cliff toward me or the way the fog crept over Preikestolen as we stood 600 meters above the ground. I can’t even describe the languages I heard around me, sometimes so close to English that it felt as though I couldn’t even understand my native tongue. And more importantly, I can’t describe the way it felt to be in the middle of it all, as if I was constantly holding my breath and waiting to wake up, to find out that it was all a dream. But it wasn’t a dream or a fairytale, and that fact just makes me feel just another emotion I don’t have words for, either. And there it is again, that feeling I can’t describe, those words that play on repeat in my mind: wow, this is my life. I can’t wait to see what’s next.